Swedish carmaker Volvo has announced that it will reveal the new XC60 at the upcoming Geneva Motor Show. The new SUV will feature a brand-new design language, and going by what Volvo has achieved with the stunning XC90 and S90, expect the new XC60 to be looker. 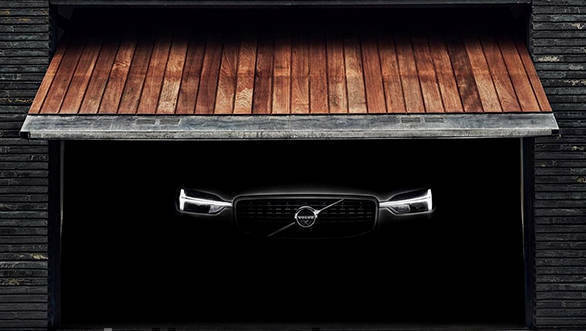 The image reveals the new grille and the Thor's hammer style LED DRLs which is slowly turning out to be a Volvo signature style element. Besides design, there's something else that's synonymous with a Volvo - safety. In the 2017 XC60, Volvo has introduced three new driver assistance features that take automotive safety to a whole new level. The new safety systems have one common aspect, steering assistance or support. What that essentially means is that the XC60 will steer automatically and away from an obstacle in order to avoid an accident. Similarly, the Oncoming Lane Mitigation avoids collisions with vehicles coming from the opposite lane. The XC60 will steer back into the right lane if it feels the driver is taking too long to react to oncoming traffic and a collision is imminent. This system is particularly useful while driving on busy dual carriageways. Steering support in this feature is active only when the car is travelling at speeds ranging from 60-140kmph. The optional Blind Spot Information System also gets steering assistance. In case another road user is invisible to the driver due to a blind spot, the system first alerts the driver. If the driver ignores or fails to react, the steering assistance system will steer the XC60 back in its own lane, thereby avoiding a collision. Steering support should serve as a lifesaver for drivers who'd other wise panic and not react in time or get startled and not react at all. Besides this, the XC60 will receive a suite of safety features those are present in its elder siblings, the XC90 and S90. These include large animal detection, run-off road mitigation and optional pilot assist. Speaking about the safety systems in the new XC60, Malin Ekholm, senior director, Volvo Cars' Safety Centre, said that the new XC60 benefits from the safety technology that is present in its bigger 90 series cars. This is also in line with Volvo's vision that no one will be killed or seriously injured in a new Volvo car by the year 2020. He also adds that the new safety features show the strides Volvo has taken in developing fully autonomous cars for the future. The new XC60 is expected to go on sale in India soon after the international launch. Whether the entire suite of safety systems will make it to the India-spec model is still debatable. This is because radar-based safety systems were disallowed by the government until recently. Volvo, in fact, is the first manufacturer to have launched a vehicle with radar-based safety equipment in India. Its large animal detection and other such features are present in the XC90 T8 Excellence plug-in hybrid SUV.